Chain Conveyors are an economical solution for transferring heavy products with sturdy conveying surfaces. They are effective as side transfers and provide accurate indexing solutions. Multistrand units can be utilized for wider loads. Chain Conveyors are suitable for extreme environments because of the low number of moving component parts and limited amount of required maintenance. Fixture assemblies nest parts accurately and are effective in supporting robotic pick & place systems. Chain conveyors are primarily used to transport heavy unit loads, e.g. pallets, grid boxes, and industrial containers, but may suit various products and can be configured accordingly. Chain Conveyors are frequently utilized in the auto manufacturing, parts manufacturing, warehousing, foundries and logistics industries. 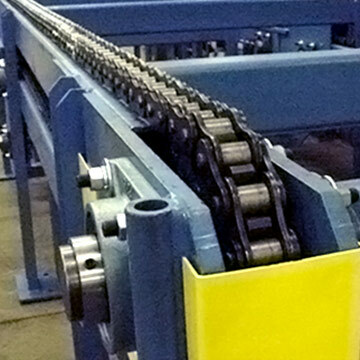 Rolmaster can accommodate most standard and non-standard Chain Conveyor requests.